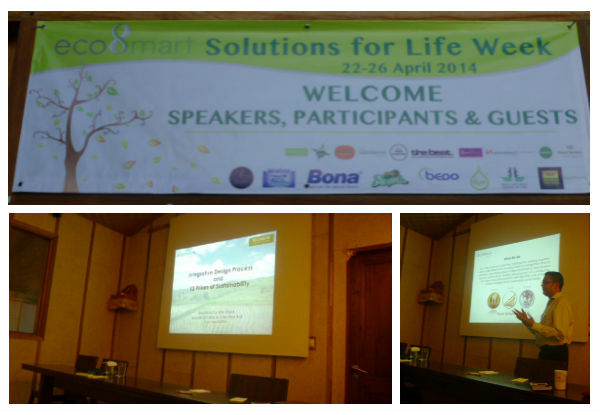 The GreenAsia Group and Begawan Foundation joined forces for a presentation at the Little Tree Bali event, Solutions for Life Week, on 24 April 2014. Mr Vinod Kesava, TGAG’s Executive Director/COO, delivered a presentation on Integrative Design Process (IDP) and 12 Pillars of Sustainability, examining the interrelated systems that underlie the triple-bottom-line approach – People, Profit, Planet. To complement the presentation, Ms Tasya Karissa, Administrator at Begawan Foundation, spoke briefly about the importance of biodiversity and the environment in TGAG’s Sustainability pillars, demonstrating the part played by Begawan Foundation’s Bali Starling Breeding and Release Project, and the way in which the program itself assists in environmental sustainability. The event was attended by professionals in both the energy efficiency and the conservation world.